A recent press release out of the Jem and The Holograms camp recently confirmed she’s found a new writer in the form of Kelly Thompson, known for her superlative work on The Girl Who Would Be King. Which makes us that much happier to hear her take on this new role on Jem and The Holograms. “Jem and The Holograms” Animation ran from 1985 to 1988. Some of you not familiar with the comic may know about Jem and The Holograms 80’s animation, with all that pop-y, bubblegum goodness. It followed the (mis)adventures of music company owner an pop icon singer Jerrica Benton aka Jem and her band the Holograms. With Ross Campbell at the helm of the comic art, we suspect this duo will make lots of headway in the creative depart. “As a kid I was a huge fan of the original 80’s JEM AND THE HOLOGRAMS cartoon and so the chance to breathe new life into it for a savvy modern audience, not to mention to work with Ross, an artist practically destined to draw this book, is really a dream come true,” said series writer, Kelly Thompson. 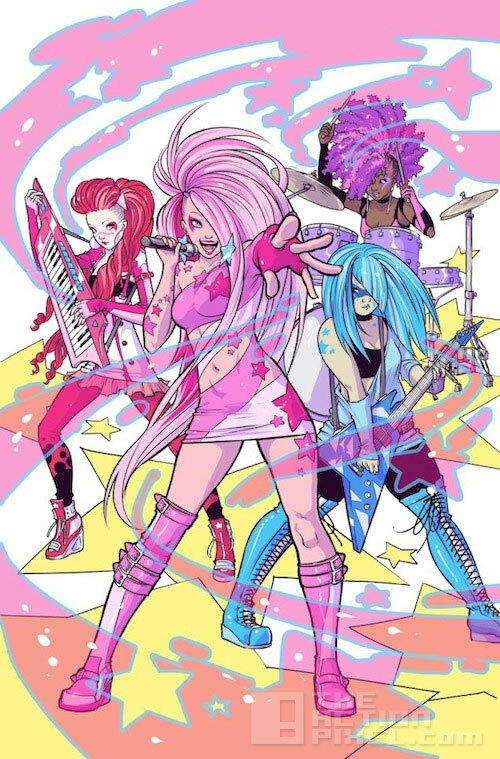 Jem and The Holograms‘ new ongoing series is set for launch in March 2015. “Star Wars” has an untitled live-action TV series coming out. And Jon Favreau is at the helm.